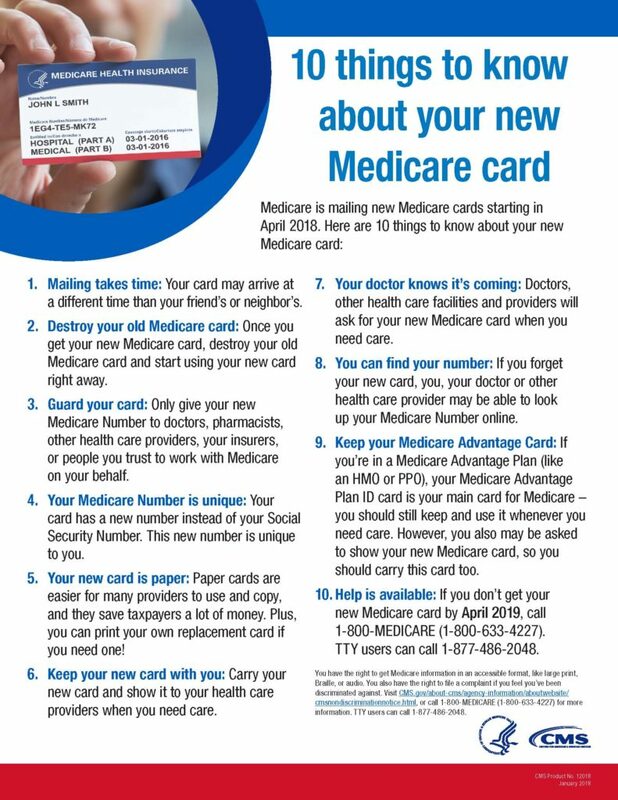 Starting in April 2018, Medicare will mail new Medicare cards to all people with Medicare, to help protect you from identity fraud. Fraudsters are always looking for ways to get your Social Security Number so we’re removing Social Security Numbers from all Medicare cards to make them safer. And there’s more good news—Medicare will automatically mail your new card at no cost to the address you have on file with Social Security. There’s nothing you need to do! If you need to update your official mailing address, visit your online my Social Security account. Destroy your old Medicare card right away. Use your new card. Doctors, other health care providers, and plans approved by Medicare know that Medicare is replacing the old cards. They are ready to accept your new card when you need care. Beware of people contacting you about your new Medicare card and asking you for your Medicare Number, personal information, or to pay a fee for your new card. Treat your Medicare Number like you treat your Social Security or credit card numbers. Remember, Medicare will never contact you uninvited to ask for your personal information. For more information about your new Medicare card, visit go.medicare.gov/newcard. You can also visit Medicare.gov for tips to prevent Medicare fraud.